This is a warm-up ride to ease the legs and body into it. Some of you may have only recently stepped off a plane so this ride offers a great way to “tease” out any tiredness. Other: Walk to the medieval tower of Leccetto and the abandoned church of Sant’Alberto. Ride: A 70km loop where we’ll visit the enchanting towns of Asciano, Monteroni and Buonconvento. Other: Visit to Monte Oliveto Maggiore Abbey or an afternoon visit to the Rapolano Spa. Ride: Today we’ll take in the beautiful Chiana valley. Loads of picture postcard scenery along the way. Other: Visit to the Italian Fashion Outlet at Valdichiana. Other: Wine tasting at lunch and cooking class in the evening! Ride: What a spectacular day awaits. We ride to the hill-top town of Montalcino, known prinicipally for its Brunello wine! Which we’ll sample at lunch! Other : Evening, wine tasting appreciation class with sommelier! Ride: Today we’ll ride to Siena, famous for the annual Palio, the bare-back horse race run around the Siena square. Absolutely stunning city! Other: Olive oil tasting during the day. 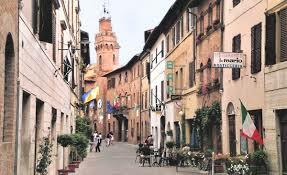 This is a very short transfer so we will stop for lunch along the way in Sienna or San Gimignano. Ride: Spectacular day's ride through the hills and wineries of the Chianti region with a stop in Gaiole, the small town famous for the annual Eroica bike race which replicates vintage bike racing on unsealed roads. We will visit the bike museum and spend some time in the village.